Presumably, the United States does not want the Taliban, an organization of Islamist fundamentalists, to dominate Afghanistan. After all, the United States invaded Afghanistan in the first place because the Taliban allowed its ally, al Qaeda, to use the country as a safe base of operations, from which the terrorist group launched the Sept. 11 attacks. And then American forces, along with allies in NATO, toppled the Taliban's totalitarian regime in 2001, and have been battling its insurgency ever since. During that time, the Taliban maimed and killed thousands of brave Americans, whose scars and memories serve as a constant reminder of the Islamist group's savagery. Yet, today, the United States is negotiating a peace deal with the same Taliban to end the war in Afghanistan. Sitting down with the Taliban is itself not so problematic—many wars have ended with enemies reaching some kind of agreement. The problem is what that agreement will look like. And in this case, all of the signs are deeply troubling. The United States seems prepared to withdraw all of its soldiers from Afghanistan in exchange for, in part, a guarantee from the Taliban that it will prevent terrorists from using Afghan territory. The plan is based on the United States taking the Taliban, a supremacist organization that seeks to establish its own Islamic state in Afghanistan, at its word. Never mind that Ayman al Zawahiri, the leader of al Qaeda, has sworn allegiance to the Taliban's emir, Mullah Haibatullah Akhundzada. And never mind that, just on Monday, a Taliban fighter carried out a roadside bombing near the main American military base in Afghanistan, killing three Marines. Normally countries in peace talks show some willingness to … achieve peace. The [proposed peace] deal calls on the Taliban to begin talks with Kabul, but the Taliban has consistently rejected such dialogue. 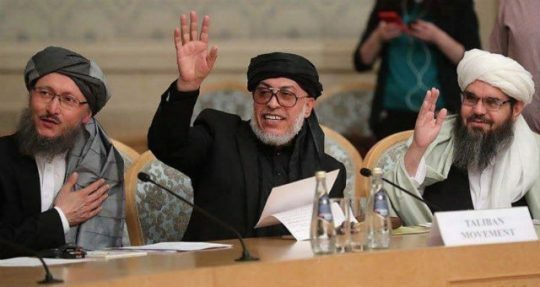 The Long War Journal notes that the Taliban has called the Afghan government "impotent" and a "puppet" subservient to the United States, and has called talks with it a "waste of time." The Taliban has not budged from this position. The group believes that its Islamic government is the only legitimate form of rule in Afghanistan, and that, as Mullah Omar, the Taliban's founder who died in 2013, said, "We have come out for the purpose of sacrificing in the path of Allah and establishing the law of the Allah on His servants." If anything, the Taliban seems to be hardening its hostile views toward Kabul. On Friday, the Taliban announced the start of its spring offensive, as it does each year (although its attacks never cease during the winter). It is telling that the jihadist group called the offensive the "Al-Fath [Victory] Jihadi Operations," indicating that its leaders see victory on the horizon. It is even more telling that, in its announcement, the Taliban indicated that it will prioritize attacks on the Afghan government, military, and police, rather than on American and NATO forces. "A key part of Al-Fath Operations is peeling away of countrymen serving in the military ranks of army, police, and militias and being used by invaders for their own objectives," the Taliban said, according to the Long War Journal. That message differs from last year, when the Taliban said its "primary target will be the American invaders and their intelligence agents. Their internal supporters [the Afghans] will be dealt with as a secondary target while the present and future mischievous plots of the mischief-mongers will be nipped in the bud." The Taliban also made clear in other statements this week that it will not work with the Afghan government or civil society. Again, the United States presumably does not want the Taliban to dominate Afghanistan. Washington seeks a long-term, sustainable agreement that will put Afghanistan on the path toward stability and greater freedom. That would require either the Taliban's defeat, or the Taliban and the Afghan government working together. It seems the United States is going for the latter. The Taliban, however, wants the exact opposite. While announcing its spring offensive, the jihadist group repeatedly said it seeks to reestablish an "Islamic system" of governance and referred to itself as the "Islamic Emirate." That does not sound like an organization willing to compromise. Indeed, the Taliban wants to impose its will on Afghanistan and control it completely. So the United States wants an agreement that does not leave Afghanistan a chaotic mess when it withdraws American troops, and Washington is negotiating with the Taliban to strike such a deal. But the Afghan government is not involved because the Taliban refuses to work with it. But, either way, what the Taliban really wants is to retake total control of the country under a totalitarian, Islamist system. Does anyone else see a problem here? Does anyone else see the logic of this approach break down pretty easily? The cold truth is that an American withdrawal from Afghanistan will lead to the Taliban retaking control. The group already controls or contests more than half the country, and its sway will expand—and quickly—without American troops on the ground. Make no mistake: such a scenario will facilitate the formation of al Qaeda and the Taliban's imagined caliphate, with Afghanistan as its cornerstone. Is the United States prepared to live with the consequences? If not, leaders in Washington better rethink their current approach to negotiating Afghanistan's future. This entry was posted in National Security and tagged Afghanistan, Al Qaeda, Taliban, Terrorism. Bookmark the permalink.